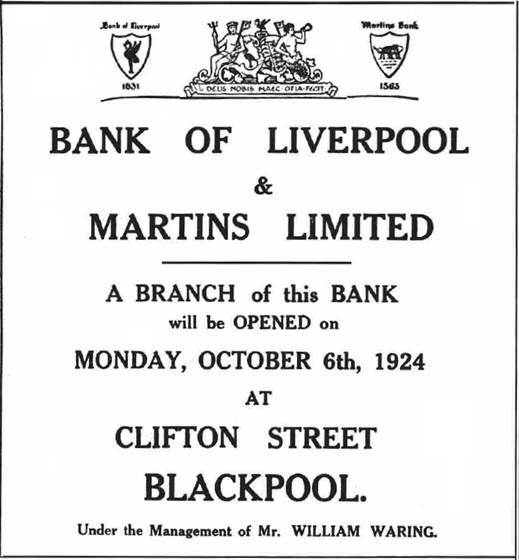 For most of the 1920s, the Bank is known as the Bank of Liverpool and Martins Limited, born of the amalgamation of the Bank of Liverpool, formed in 1831, and the much older Martin’s (WITH an apostrophe) Private Bank, that traces its roots to Elizabethan London, and the trading activities of Sir Thomas Gresham in 1563. 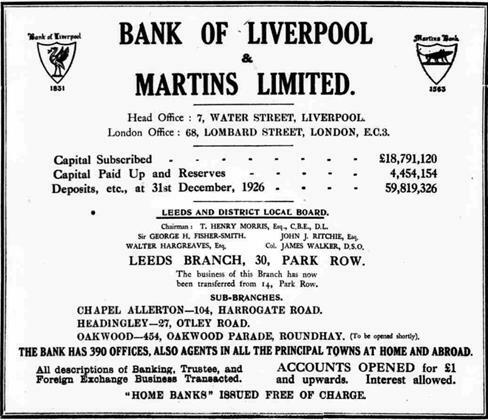 With nearly 500 branches, the Bank of Liverpool and Martins covers much of the Northern part of England, but it is the addition of the branches of the Lancashire and Yorkshire Bank in 1928, that sees the creation of Martins Bank Ltd, and a branch network that can now earn sufficient profits for the Bank to embark on a massive expansion. 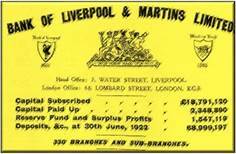 By 1969 the number of branches will be almost double what it was in 1918, and every major town and city in England, and many in North and South Wales, will have one or more branches of Martins. To begin with, the Bank’s Advertising is purely functional – to put facts and figures in the public domain, at a time when banking is not something that is widely understood by “the average man in the street”. 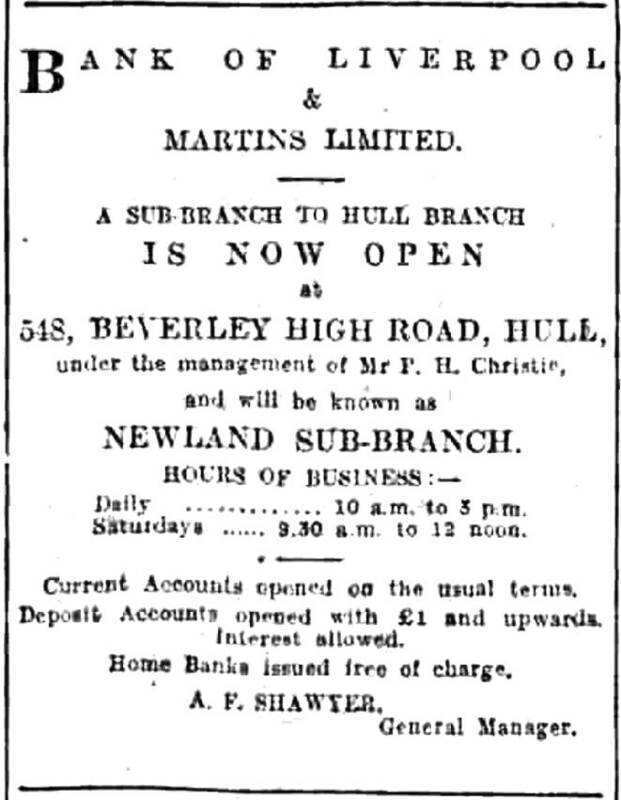 This is one of the early advertisements for the new MARTINS BANK LIMITED and it appears in the Hull Daily Mail on the morning of 4 December 1929, a couple of days after a new branch is opened at Bridlington. 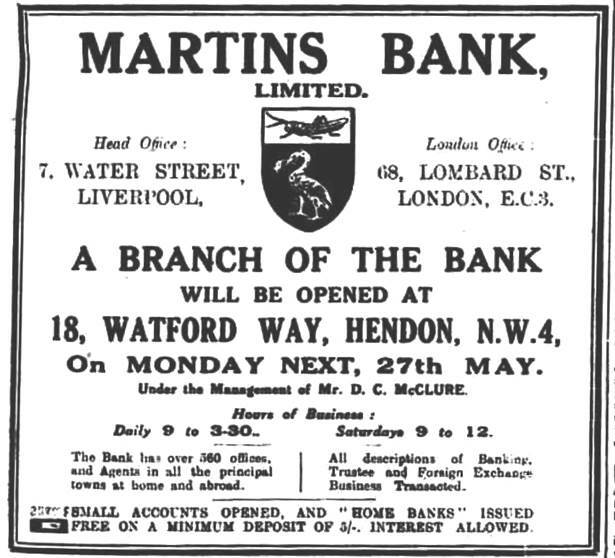 It is unusual, because it crams a lot of information into a small space - not only details of the new Branch, but also the addresses of Head Office in Liverpool, and the Principal London Office at Lombard Street, AND details of the number of Martins Branches, and the services the Bank has to offer. Later decades will see a reduction in the number of “wordy” adverisements, in favour of imagery – in this particular advert, we have only the Martins Coat of Arms to break the monotony. Images © Northcliffe Media Limited Image created courtesy of THE BRITISH LIBRARY BOARD. Is this the first “portable” advertising? 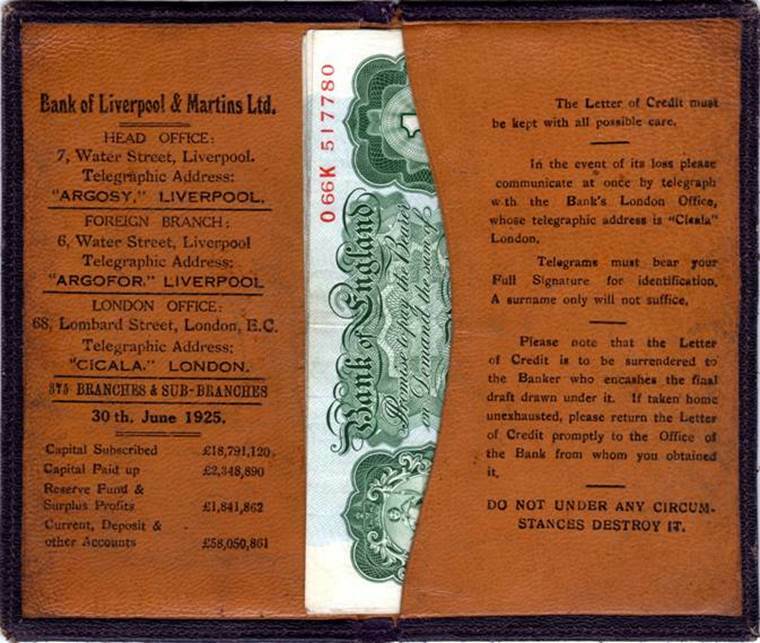 This wallet from the Martins Bank Archive Collection, is an extremely rare example of an early “giveaway” and is also a form of advertising. The more “well to do” amongst the Bank’s customers may well have needed to travel outside Great Britain on business. 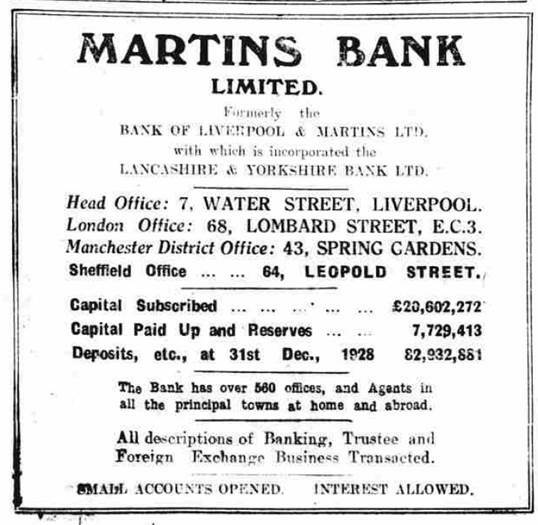 They would approach the Bank to ask for a Letter of Credit – literally a letter addressed to a particular bank in a particular country, with whom Martins was affiliated. The letter of Credit contained within the wallet, would instruct the foreign bank, on production of the agreed ID from the customer, to pay over a single amount, or several amounts on various days, to assist the customer to meet their living and travelling expenses whilst away from home. The foreign Bank would have its own arrangements for recovering the money from Martins. 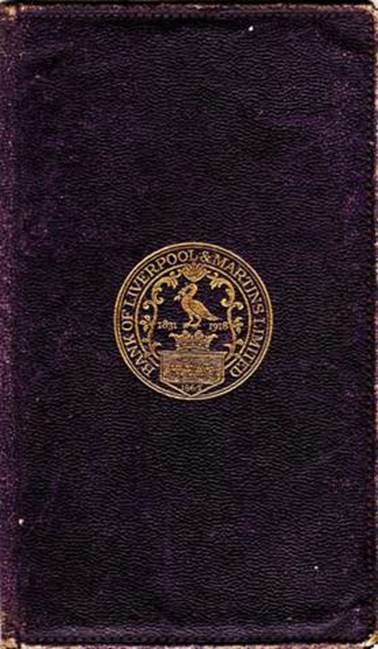 The inside covers of this charming wallet, (which by the way is actually made of leather, and therefore not given away to “just anyone” in the 1920s), provide a good deal of information to the customer, and anyone else who sees it, about the Bank and its assets – a statement of strength and stability which is an obsessive trait of Martins for decades - until they re-think their self promotion and advertising policy in the early 1960s. The wallet also provides detailed instructions on using the letter of credit and what to do if it is lost, as well as the addresses of some of the Bank’s key offices, and details for contacting them by that most efficient of electronic means, the telegraph. 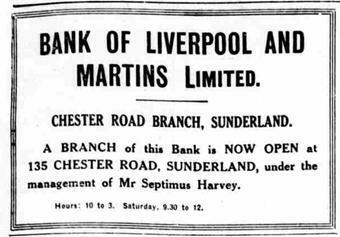 When you consider that almost none of our modern methods of communication and of moving money around the World in a split second exists in the 1920s, it is forward thinking of the Bank of Liverpool and Martins to make arrangements for travellers. 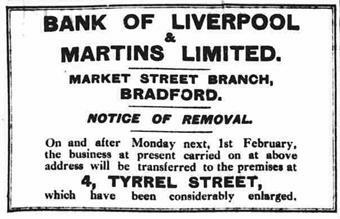 After 1928, the modern day Martins Bank will have three major Foreign Branches, offering a wide range of services. Travellers’ Cheques will be the first revolutionary way in which money can be made portable around the Globe.